﻿ WHICH MOBILE PHONE SHOULD I BUY ? Home / Onthego Services Pty Ltd / WHICH MOBILE PHONE SHOULD I BUY ? WHICH MOBILE PHONE SHOULD I BUY ? That’s a question people ask me every day. People start to asking this question when their phones suddenly stopped working or get damaged. Well, there are a lot of factors one should consider before they buy a new phone, but the following 3 are the most important in my opinion. Firstly…money! If you have plenty of money for a new phone, say 1000+ dollars, they go the popular brands and their flagship models. Like the Apple iPhone 6S, Samsung Galaxy S6, Sony Xperia Z5 or Blackberry Priv. They are powerful enough for most people and for the next 3 or 4 years. If you have a limited budget, for example 700 dollars, then go the last generation Apple iPhone 5/5S or Samsung Galaxy S5. Only two years old models, but they are still powerful enough for most people and again for the next 2 or 3 years. If less than 500 dollars, I personally still recommend Apple iPhone 5C, or Samsung S4 phones, even second hand ones. So if you have the money go the popular brands and flagship models. Secondly, reliability. Especially important for business people and professionals who keep important data in their phones. There is no doubt that iPhone is the best choice, as long as you don’t drop it into water or fire, it will work perfectly okay even you smash the phone and the touch glass is completely shattered. And IOS today is completely different from 5 years ago, you can download songs, movies without iTunes, and backup every detail onto your computer very easily. The only thing you need to do is…create an Apple ID… most Android phone will ask you do the same. I would not recommend any other phone in terms of reliability, for example, Samsung phones will stop starting or working without any early signs, and it happened a lot. Thirdly, easy to use. Most iPhone IOS users who buy a Android phone will go back to iPhones very soon, but Android phone users who start using iPhone… will stay with iPhone. Apple IOS has the best user experience. Give you one example: a customer ever told me that “My 80 years old can only use iPad, not any tablets I gave to him”. For myself, I use iPhone 6S as my daily phone, keep a Blackberry Priv as a back up. And also use Samsung latest phones… for testing and see how it improves. There are a few other popular brands, but NEVER buy a HTC phone. The reason? It takes too long to tell you reasonsss, and it will hurt my keyboard. 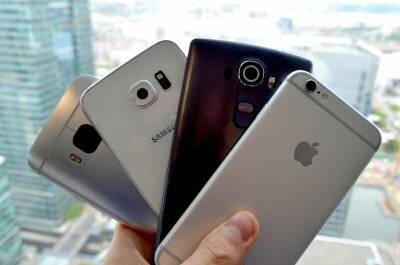 And I also add “It will cost similar amount of money to buy an iPhone, Samsung or Sony new flagship phones, but in the long run, iPhone will cost you a lot less than any other phones, because Samsung spare parts are much more expensive, this will double or even triple your maintenance cost”.